Leggett & Platt Adjustable Bases are made by the Adjustable Bed Group of the Residential Furnishings segment of Leggett & Platt Incorporated (the other segments are Industrial Materials, Commercial Fixturing & Components, and Specialized Products). Besides adjustable beds, Residential Furnishings also makes ornamental beds, bedding support products, and bedding textile products. L&P also makes VertiCoil steel spring units used by several mattress manufacturers in their innersprings. Leggett & Platt began in 1883 as a partnership of J.P. Leggett and C.B. Platt of Carthage, MO. Their first product was the L&P bedspring. The company, which has operated continuously since then, was incorporated in 1901. Currently, Leggett & Platt offers five series of adjustable beds: Premier Series, Designer Series, Comfort Series, Classic Models and the newest, Brio, which was unveiled in mid 2013. 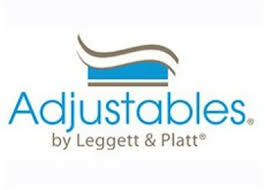 Leggett & Platt posts a comparison of all their current adjustable beds (Brio has yet to be added) online. According to the company, "All Leggett & Platt Adjustable Bases are compatible with most standard headboards, footboards, and rails." The Premier Series of Leggett & Platt Adjustable Bases is the top product line. The sole model is the Prodigy. It has a lifting capacity of 700 lbs., a remote with clock and alarm, and an "anti-snore" position. The Designer Series of Leggett & Platt Adjustable Bases has three models: D-122, D-222, and D-222S. All three models feature a lifting capacity of 700 lbs., dual massage, and the zero gravity position. The D-222 and D-222S also have a furniture-grade covering and wooden furniture legs. The four models of the Comfort Series of Leggett & Platt Adjustable Bases have wired remotes (the other series have wireless), microsuede covering, 4" legs with casters, and a lifting capacity of 700 lbs. for the C-122 and C-120 and 600 lbs. for the C-110 and C-010. The D-122 and C-122 are alike in some features, such as range of positions, but differ in others, such as wireless or wired remote. You may check the comparison chart on L&P's website (see link above). The Classic Models of Leggett & Platt Adjustable Bases are Designer Series Classic, S-Cape, Simplicity, Pro-Motion, Bronze, Silver, Lifestyles, and Optima. In mid-2013, Leggett & Platt unveiled their newest line of adjustable beds/bases, Brio. These are designed for persons needing adjustable bases who prefer the quality associated with a name brand, but have limited budgets. Brio Adjustable Bases are far less expensive than other Leggett & Platt adjustable beds. There are three models: Brio 20, Brio 30 and Brio 60. Leggett & Platt also makes custom adjustable bases for certain mattress manufacturers. The Leggett & Platt lineup of adjustable beds for 2016 is simple: Premier Furniture Style, Premier Foundation Style, and Prodigy 2.0 constitute their Premium Models series, formerly the Premier Series. Prodigy 2.0 is the latest version of L&P's top-of-the-line model, Prodigy. Premier Furniture Style is a deck-on-deck model designed to be a stand-alone adjustable bed that looks like an ordinary bed when in the flat position. Premier Foundation Style is a deck-on-frame design. It can fit within an existing bed frame to fit with whatever bedroom suite the owner has. No longer listed on the L&P website are the Comfort Series models (C-010, C-110, C-120, C-122), Designer Series Classic, Bronze, Silver, Lifestyles, and Optima. Also without mention are the Premier Series P-n32 models (P-132. P-232) and the Brio line of more affordable adjustable bases. However, they are still available through some retailers, such as Sleep Comfort Adjustable Beds, Bedrooms & More Seattle, and Pure Crafted Beds. Here are the current reviews for beds from "Leggett and Platt"